"…at this point, we have no indications that core al-Qaida, which I think is what most people are referring to when they talk about, quote, al-Qaida, directed or planned what happened in Benghazi. …..So it is not the U.S. Government's assessment or position that Ansar al-Sharia is an affiliate of core al-Qaida. We don't recognize them as an affiliate of core al-Qaida… These folks don't carry ID cards. They don't come out and wear a t-shirt that says, 'I belong to al-Qaida,' right?" I beg to differ. In addition to the tremendous amount of evidence and statements by members of the House Intelligence Committee claiming that intelligence indicates al Qaeda was involved and that Ansar al Shariah is widely believed to be affiliated with al Qaeda, there are simpler, more obvious indicators. Ms. Harf is correct, they don't carry ID cards or wear T-shirts that say "I belong to al Qaeda," but they do throw hand signs and leave graffiti behind in the same manner as gangbangers that just marked their territory after murdering their rival. The quintessential image that is used in almost every news report about the Benghazi attacks depicts one of the assailants in a white T-shirt with an assault rifle posing with his index finger pointing up in front of the burning consulate. The man is seen in several photos making this gesture using both his left and right hands. This does not signify that he is number one. This gesture is one of the most prevalent Salafi jihadist hand signs. There are images of every al Qaeda leader, including Osama bin Laden, Abu Musab al Zarqawi and others, with their index fingers pointing skywards. Ayman al Zawahiri, the current leader of al Qaeda, is often seen in images making the hand sign. His former top lieutenant Mohammed al Jamal, of the Jamal Network, is believed to have had fighters in the assault on the U.S. diplomatic compound and they would be familiar with this gesture. In October, the State Department designated the Jamal Network as a terrorist group tied to al Qaeda. The hand gesture also appears on jihadist forums, protest posters, Facebook, Instagram, and Twitter, and in almost every form of al Qaeda propaganda. It is also a favorite gesture among Chechen jihadists, members of the Caucasus Emirate, those most likely responsible for the recent suicide bombings that killed at least 31 people in the city of Volgograd, Russia. Their leader, Doku Umarov, has also been photographed making the jihadi hand sign. For Salafi jihadists groups, the hand gesture of the index finger pointing up represents one God and their willingness to die for Islam, thus attaining martyrdom and entrance into paradise. This Islamist hand sign is also commonly used by radical Imams around the globe while they are recruiting young men to join the global jihad and murder soldiers in their own countries. Although this hand gesture is one of the most recognizable signs of al Qaeda-affiliated jihadist groups, the Obama administration either overlooked, or worse, were unaware of the identifier when they portrayed the attack as a spontaneous protest against an anti-Islam film. 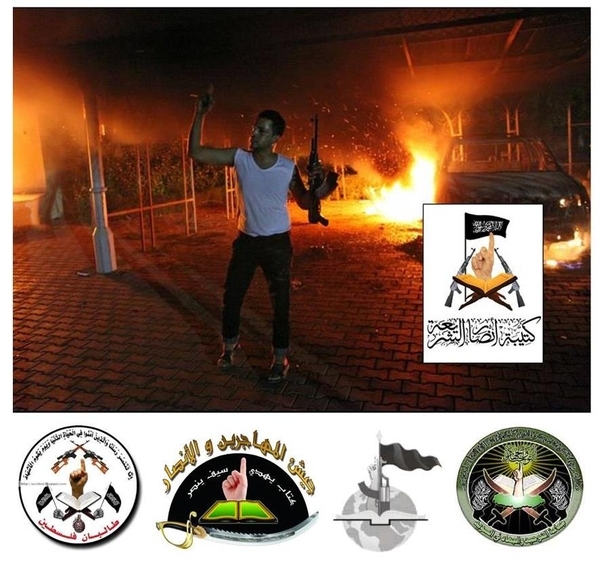 If there is any doubt that Ansar al Sharia Libya is affiliated with al Qaeda, the hand with the index finger pointing up is the central image of their logo. It also happens to be the primary image in the center of al Qaeda's logo and al Qaeda-affiliated group logos, such as Jaish al Muhajireen awl Ansar in Syria, al Qaeda in Iraq, Palestinian Taliban and others. Similar to street gangs, symbols and gestures demonstrate affiliation with their larger organizations, such as Folk Nation or People Nation. Like the Bloods or the Crips, Ansar al Sharia should be viewed as one street gang in the al Qaeda Nation. Distinctions between "core" al Qaeda are irrelevant as these Mujahideen gang bangers share the same goals and the same enemies. If the gesture was not enough, the Jihadist gangbangers also decided to leave their mark in graffiti. Two different spray-painted Arabic-language graffiti messages that read "Allahu Akbar" were scrawled on the buildings of the U.S. diplomatic facilities in Benghazi, Libya during the 2012 terror attack. Spray painting "Allahu Akbar" is becoming very popular among young jihadists who are vandalizing churches and war monuments with their battle cry in graffiti. Of course, the State Department could claim that the graffiti was just a benign expression of faith, except for the four dead Americans and the burned-out U.S. consulate building. In combination with the quintessential photo of the assailant using the al Qaeda jihadist hand gesture, the messaging was clear that it was not an anti-Islam film protest. Of course, you have to suspend political correctness to be able to interpret the signs that are literally on the wall. Gang identifiers are visual or verbal ways that gang members identify their affiliation. Law enforcement is trained on gang identifiers so that they can recognize violent incidents as being affiliated with particular street gangs or Security Threat Groups. Unfortunately, training on Islamist identifiers is currently prohibited under the Obama administration, which is why obvious signs continue to go unrecognized. Dawn Perlmutter Director and founder of Symbol & Ritual Intelligence and Associate Fellow at the Middle East Forum is considered one of the leading subject matter experts (SME) in the areas of symbols, unfamiliar customs, ritualistic crimes and religious violence.